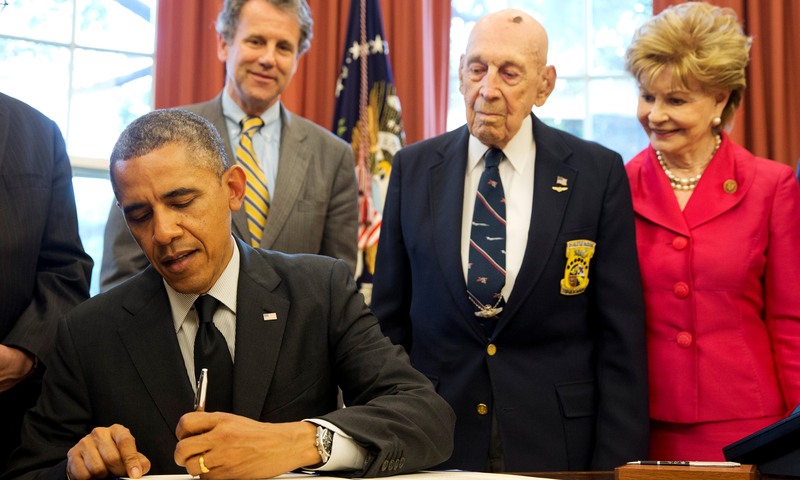 President Obama signed two bills Friday conferring the Congressional Gold Medal on the Doolittle Raiders, a group of Air Force veterans who staged bombing raids over Tokyo during the height of World War II, and the rest of the famed American Fighter Aces. Along with the Presidential Medal of Freedom, the medals are considered the nation's highest civilian honor. Congress awards the medals to individuals who have "performed an achievement that has an impact on American history and culture that is likely to be recognized as a major achievement in the recipient's field long after the achievement," according to the Congressional Research Service. The Doolittle Raiders, named after their leader, then-Col. Jimmy Doolittle, flew a successful bombing raid over Japan's capital on April 18, 1942. The raid provided a critically-needed morale boost for the American public. It also proved "to the Japanese high command that their home islands were not invulnerable to American attacks and [caused] them to shift vital resources to their defense," according to the raiders' official website. "Two months later that decision would play a role in the outcome of the Battle of Midway, the American victory that would begin to turn the tide in the Pacific War," the raiders explained. Only four of the original 80 raiders are still alive, and several of them joined the president this afternoon for the signing ceremony in the Oval Office.